(1758-1808) Born in Dedham, Mass., he graduated from Harvard College in 1774, studied law, was admitted to the bar, and practiced in Dedham. He served in the Massachusetts State House of Representatives in 1788, and was a member of the Massachusetts convention that was called for the ratification of the Federal Constitution. Elected as a Pro-Administration candidate for the First through the Third U.S. Congresses and as a Federalist to the Fourth Congress, he served from 1789-1797. He was the chairman of the Committee on Elections. He served as a member of the Governor's Council, 1798-1800. Chosen as the president of Harvard University in 1804, he was forced to decline the prestigious position because of failing health. 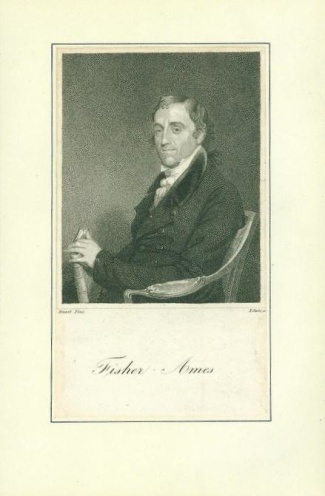 Ames was an important leader in the U.S. House of Representatives, and was highly noted for his oratorical skills, and was a very influential figure of his era. Original mid 1800's period engraving, 4 x 6 3/4, tipped to a 6 x 9 1/4 album page with black border around his portrait. Imprint of Stuart Pinx. Light age toning. Very fine. Desirable early U.S. Congressional leader. ©1995-2019 TIAS.com. All rights reserved.